Ordered, yes, not delivered yet though. with the first Asian Country in Indian Ocean with AIP and submarine launched nuclear cruise missile the first and till now only to have been able to deploy in IOR..... With the old Agosta 90B being updated and new stealth Chinese subs on the way equipped equally with nuclear cruise missiles with Pakistan r a force to be reckoned with. 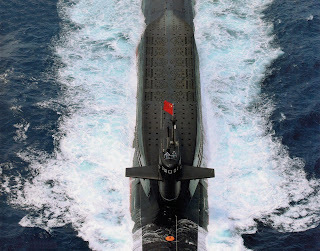 In East Asia you should have included Russia's Pacific fleet (only Russia's Arctic fleet is active in Northern Asia...): They have 7 Project 877 diesel electric subs (Paltus, or Kilo class in the NATO speech). It's quite strange to not include them. Also, US fleets are active in Asia to threaten countries that don't kneel before the Stars n Stripes (mostly China, Russia, N Korea... but Iran also is in Asia), they also should be mentioned. 7th fleet is based in Japan and exists to militarily dominate Asia. 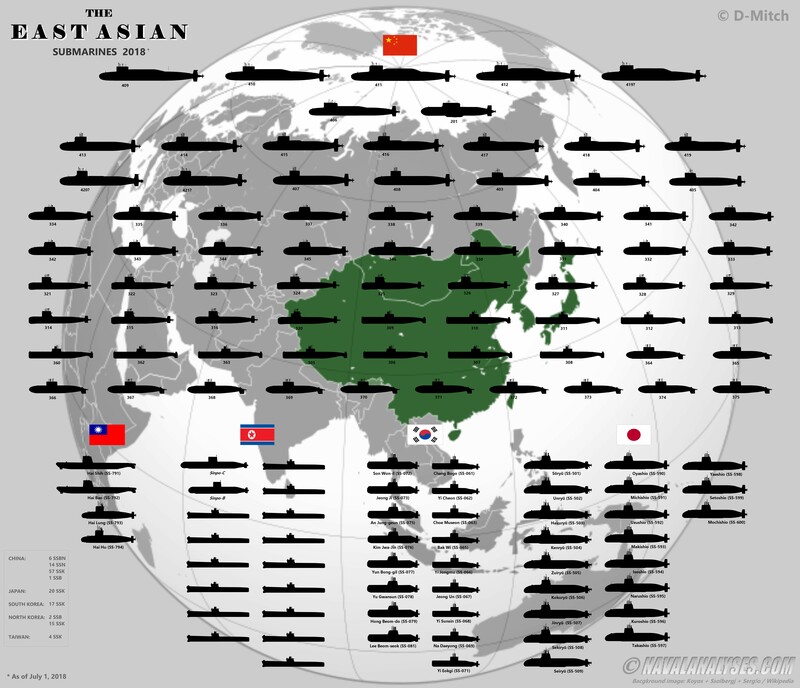 3rd fleets main objective is explicitly to be an additional threat to China and North Korea. Unreliable and possibly outraged source mentions about 30 submarines for it. Worth checking. 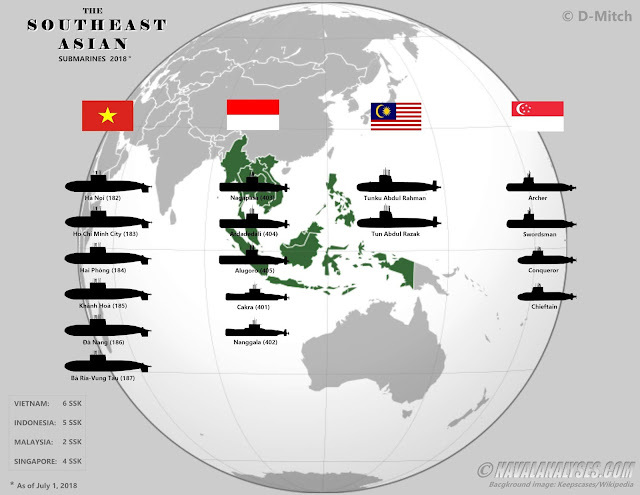 Both the 3rd and 7th fleet should be included in the East Asia infographic. 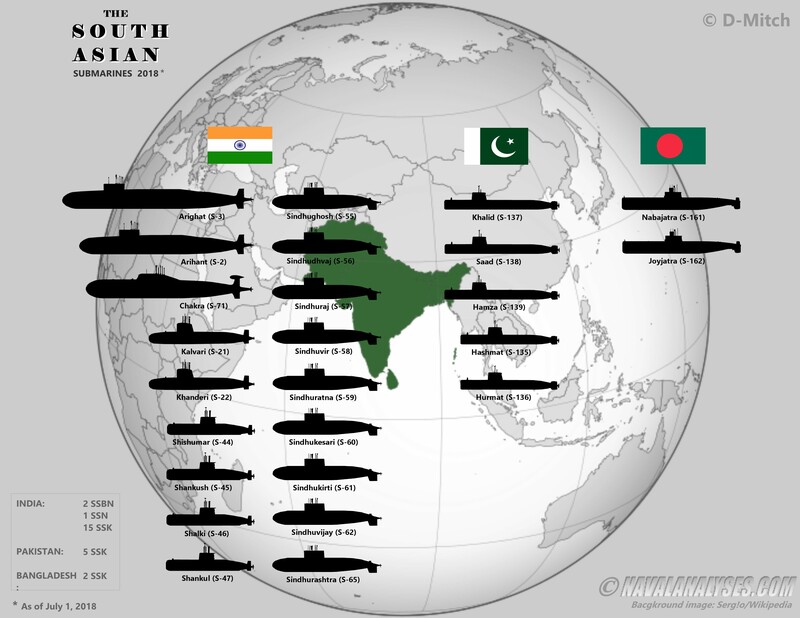 Finally, the 5th fleet main mission is to threaten Iran, or any other country of the region that would challenge the US Empire, so it should be include in the South Asia infographic. And so should the Iranian fleet. They have 3 Kilo class subs, one Besat (1200 tons) and smaller ones most of which you could omit, depending on your size limit. Sorry but I do not agree with those propositions. I deliberately did not include forces from other countries as they can increase them at will. Do you remember the Russian Syria campaign? Russians brought ships from other fleets to the Mediterranean Sea. The same stands for US fleets, etc. Only countries' navies are compared in each graph per region. Excellent work D-Mitch. Thanks for all the info.